Flourishing automotive sector in the Asia Pacific region is playing a vital role in fueling the demand for the product. Automotive manufacturers in the region generally employ tempered glass in the production of automobile windows. The growth of the segment can be assumed by the fact that alone China’s automotive sector was responsible for production of nearly 5.2 million automobiles from 2012 to 2015. Similarly, India has observed significant growth in its automobiles sector owing to government support to initiate 100% foreign direct investment (FDI) in the sector. Automotive unit sales in the country nearly increased by 2 million unit numbers from 2005 to 2015. Growing production of numerous types of vehicles and components on account of increasing R&D efforts is poised to benefit the growth of the market. The product is governed by strict regulations for its use in construction and automobile industries. LEED (Leadership in Energy and Environmental Design) defines standards for the usage and implementation of specialty glass in the construction of green building. In addition, flat glass fabricators are expected to comply with specifications by FEMA on account of use in the construction industry for safety applications. Similarly, Glass Association of North America (GANA) has defined the product category rule (PCR) pertaining to development of flat glass products. The objective of PCR is to establish guidelines with regards to development of Type III Environmental Product Deceleration (EPD). The development of this EPD is in conformance with ISO 21930 and 14025. This is projected to help vendors to conduct life cycle assessment of the product and measure the improvements with respect to manufacturing. On the basis of product, the market can be segmented into tempered, laminated, basic float, insulating, and others. The tempered glass segment held around 29.7% of the overall market volume in 2014. The segment witnessed tremendous growth over the past few years owing to rise in demand from the building and construction sector. It is manufactured by controlled thermal or chemical reaction so as to toughen the structural formation. On breaking, it doesn’t shatter into sharp pieces, rather forms small granular chunks. Such distinct properties of the product is poised to propel the growth of the segment over the forecast period. Demand for laminated glass is expected to gain share on account of increasing use in the manufacturing of windshields and front windows of airliners. The segment observed the share of nearly 27.2% in 2014 and is expected to reach 28.3% by 2022. Laminated types is manufactured by placing a sheet of ethylene-vinyl acetate (EVA) or polyvinyl butyral (PVB) in between the layers of normal glass. This sheet of PVB or EVA minimizes chances of glass to break or shatter. 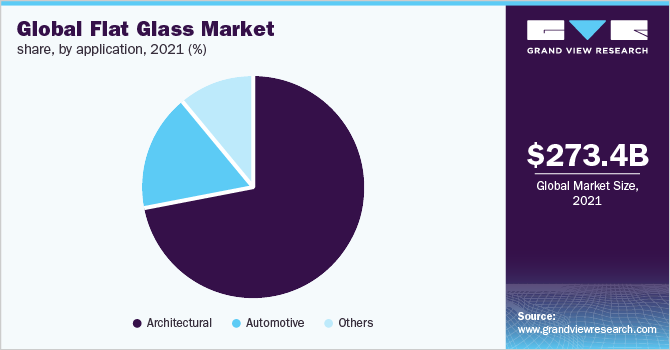 The basic float glass segment is anticipated to witness healthy growth over the forecast period, on account of its increasing and diversified application in architectural projects. Float types are primarily used in exteriors of buildings. China and western European countries are the largest markets of basic float glasses. Europe and Asia Pacific are also key consumers of insulating glasses. Increasing construction outlook in India, China, and Malaysia is likely to stimulate demand for the product over the forecast period. Additionally, the demand for this type in China has been witnessing tremendous growth on account of the country’s continuous efforts towards energy saving, thus creating ample opportunities for investments in manufacturing capabilities as well as raw material supply. The other segment observed a high growth rate over the past few years, and is expected to follow the same trend over the forecast period. Reflective glass is the most popular, owing to its rising number of installments in housing developments of China and India. On the basis of application, the flat glass market has been segmented into automotive, construction, and others. In 2014, the construction sector dominated the market and held around 81.1% of the global market. The product is widely used in construction projects. Tempered glass and basic float glass are extensively used in housing developments. They have application in both exterior and interior of a structure, in order to improve aesthetic value and to avoid fragility. Despite the majority of the market being dominated by the construction sector, the automotive sector employs high usage of flat glass. Laminated and tempered type of the product is largely used in manufacturing of windshields and windows of the automobiles. Solar and electronics applications of the product define the others category. Surging demand for the product in solar projects is working in favor of the market. Asia Pacific and Europe are likely to register strong demand for the product and are estimated to exhibit promising growth over the forecast period owing to increasing construction activities. In addition, the U.A.E. and the U.S. are also projected to experience stable demand for the product due to rising infrastructural investments. In terms of region, Asia Pacific was the leading region in 2015 and is anticipated to show the same trend throughout the forecast period. Presence of a wide manufacturing base of power engines in China is one of the key factors contributing to the growth of the regional market. Rapid industrialization and expanding automotive sector in Asia Pacific are likely to drive the market. Favorable government initiatives in economies such as China and India for supporting the growth of the automotive sector are supplementing the growth of the market. Europe had a stable growth in the last few years and is projected to post an identical trend until 2022. North America is relatively mature and is characterized by new product developments and growing preference towards laminated products. As of 2014, North America held a moderate share in the global market. In North America, the U.S. is at the forefront of the market owing to increasing applications of the product in architectural projects. However, the region is estimated to lose market share to developing economies over the forecast period. Some of the primary players engaged in the production include Xinyi Auto; CSG Architectural; Corning Inc.; Central Glass; Schott AG; Sisecam; and Asahi India Glass. In January 2014, Corning Inc. and GOTC announced collaboration to manufacture 3D shaped product from flat glass and to expand their sales and operations in Asia. Other companies accounted for 67.5% of the market in 2014. Major companies are expected to shift manufacturing base to developing countries, including China and India, on account of low cost of production and labor. Guardian Industries, AJJ Ltd., Cardinal, Independent Co. Ltd., OldCastle, NSG Group, Saint Gobain, AGC, and PPG Industries dominated the market share in 2014. In March 2015, AGC began the supply of sliding version of light control glasses. Furthermore, in April 2015, AGC acquired polish company NordGlass that is well known for its automotive replacement products.